AND THEY USED EVERY SAIL IN THE INVENTORY! SIN DUDA! crossing the finish line off Montego Bay, Jamaica. Photo courtesy The Pineapple Cup. Congratulations to Lindsey Duda's Santa Cruz 52 SIN DUDA! taking PHRF line honors in the 811-mile Pineapple Cup, which goes from Miami to Montego Bay, Jamaica. After leading the race for most of the way, the wind gods scrambled the results a bit by placing a wind hole in the middle of the course. Course of the Pineapple Cup. “We saw a wide array of conditions on our on our run Montego Bay,” said boat owner and skipper Lindsey Duda. “We started in a strong southerly with big waves as we crossed the Gulf Stream on our easterly first leg. Once we got closer to Long Island, things calmed down and we saw light, shifty (NW/NE) winds and a lot of rain. The winds picked back up to about 25 knots as we worked our way around Cuba and through the Windward Passage (between Cuba and Hispaniola) only to have the wind shut off again on the final leg toward Jamaica. Lindsey was thrilled with the team’s finish. The Chicago-based team was especially delighted to be out of the frigid polar vortex that froze their hometown and Lake Michigan. This race is part of a season of great races. In 2018 SIN DUDA! 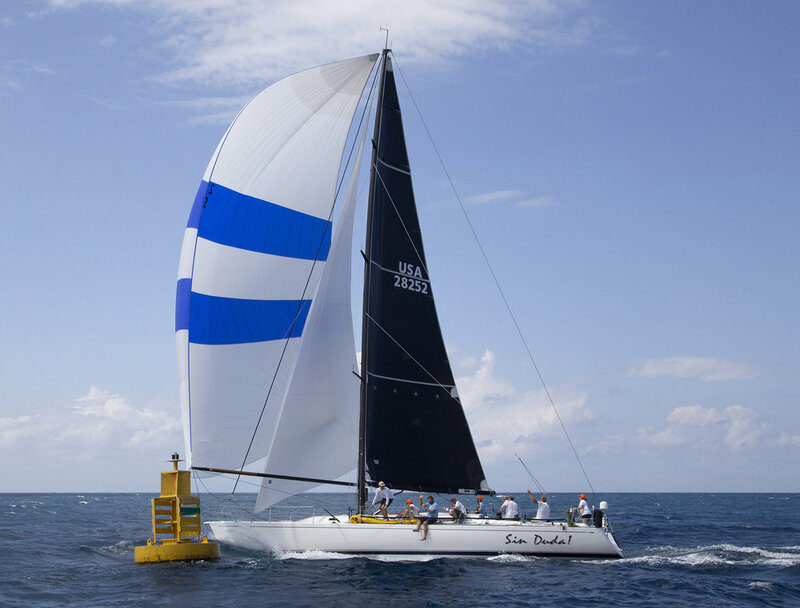 raced the TransPac from Los Angeles to Honolulu and in the middle of February they will compete in the Caribbean 600, a 630-mile race that starts and finishes in Antigua.